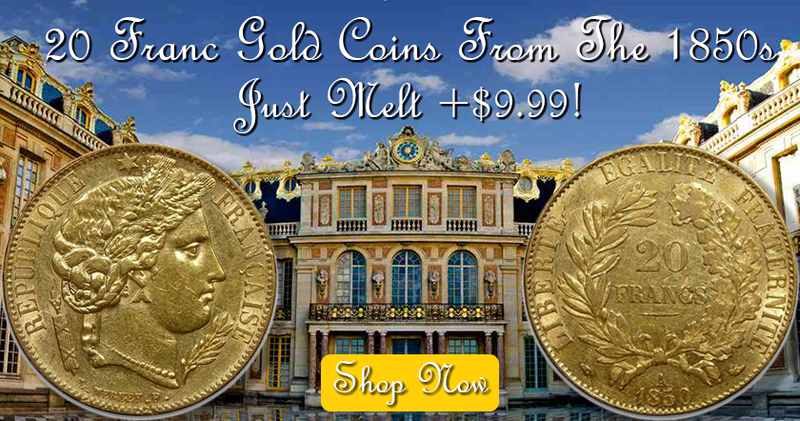 Blog - 20 Franc Gold Coins From the 1850s @ Melt +$9.99! It has been said that coins are history in your hands – and these are a perfect example! The year 1848 was a tumultuous one for France. The monarchy of King Louis Phillipe was overthrown and the Second French Republic was established. Reflecting these major changes in society, the coinage of France was overhauled. In 1850, the French 20 Franc gold coin was completely redesigned. Gone was the image of the king; instead the obverse features Ceres, the Greek goddess of agriculture and a symbol of motherhood. On the reverse, the motto “Liberté, Égalité, Fraternité” (Liberty, Equality, Brotherhood) is inscribed around a wreath. The coin’s design directly reflected the new rule of the people. However, the Second French Republic was short-lived; Napoleon III declared himself Emperor in 1852 and France became an empire again. The 20 Francs Ceres coin was struck for just two years, making it one of the scarcest types in the entire series. These coins represent a fascinating keepsake of France’s second Republic. Despite their rich history and beautiful symbolic design, they sell for an absurdly low premium over melt. We stumbled upon a small cache of these at a great low price – and we’re passing the savings on to you! 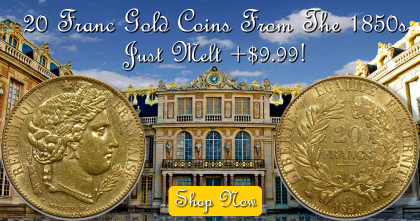 Today, we can sell a limited quantity of 1850-1851 20 Francs Ceres gold coins at just $9.99 per coin over melt. Each coin has been hand-selected by us for quality; you’ll be impressed at how nice these are despite being 166+ years old! They contain exactly 0.1867 ounces of fine gold each – this means your cost is around 4.25% over melt! Very few dealers have these available for sale, but when they do, they often quote double or triple the premium. If you’re looking for an outstanding combination of history and low premium, we simply cannot think of a better value in gold. Take advantage of this rare opportunity!